Palmarosa (Cymobopogon martinii var. motia) essential oil has a light, sweet, green-grassy bouquet with a lemony undertone. One of our favorite essential oils for skincare specifically oily and dehydrated skin. A calming yet uplifting oil to bring restoration to the body and mind. 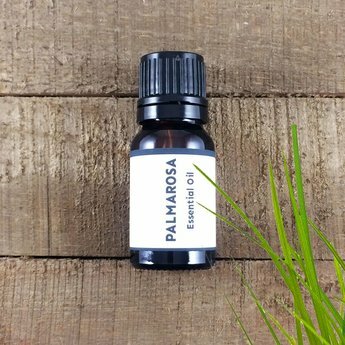 Also, a great anti-inflammatory, Palmarosa can be added to swollen ankles or applied to an itchy inflamed bug bite. Atlas cedar, bergamot, lavender, lemon, lime, mandarin, neroli, patchouli, sandalwood, sweet orange. Fun facts: Palmarosa is a grass that comes out of Asia. It is related to lemongrass and citronella. Cautions: Palmarosa is considered non-toxic and non-sensitizing. It can however be an irritant to sensitive skin if not properly diluted.